Should your organization have a web accessibility policy that sets out its responsibilities in this area? You may have already established other non-discrimination policies, such as an equal opportunity policy or an anti-harassment policy. A web accessibility policy, which outlines a framework for achieving digital accessibility for people with disabilities, is just as important. It sets principles and guidelines for ensuring that your digital properties don’t contain barriers that would prevent people with disabilities from using them – whether they’re employees within your organization, or members of the public who may wish to go on your website or use your app. Here are some do’s and don’ts to consider as you develop your organization’s web accessibility policy. Don’t confuse a web accessibility policy with an accessibility statement. A web accessibility statement is a public proclamation of your commitment to online accessibility. It’s often posted online. A web accessibility policy, on the other hand, guides the internal decisions and processes of your organization. It may not be appropriate to promote and circulate it to your customers and clients – rather, it should be distributed among the relevant departments of your organization, along with training, if necessary. Do be specific about how web accessibility is to be achieved. Your policy shouldn’t just state that your website will be “fully accessible,” or that the software you purchase for the workplace will be “usable by employees with disabilities.” Make sure you specifically state the standards or technical requirements that your digital properties will conform to. For instance, you can say that all web pages and apps will “comply with the technical requirements of Level AA of the Web Content Accessibility Guidelines (WCAG) 2.0.” This is a universally acceptable level of accessibility, with precise technical requirements developed by the World Wide Web Consortium’s Web Accessibility Initiative (WAI). In your policy, you might also cite the requirements of the WAI’s Authoring Tool Accessibility Guidelines (ATAG), which are designed for web pages that have comment sections, forums or other content that’s contributed by members of the public. Don’t take a hands-off approach. If you intend for your web accessibility policy to be followed and applied within your organization, then you need a way to supervise or enforce it. For example, how will you confirm that a new blog section that gets added, or new product pages that are uploaded, are truly barrier-free? Your policy should explain the process by which web pages are routinely monitored, for example, by a third-party accessibility partner on a regular basis. If, as part of your policy, visitors to your website can submit feedback on any accessibility problems they encounter, who will be responsible for addressing that feedback, and how quickly? Decide who will be responsible for ensuring that the web accessibility is followed internally, and what the consequences will be if it’s overlooked. If these conversations are skipped, then you are less likely to make concrete progress. Do make sure your policy is integrated throughout your organization. It’s not only your web developers who should be aware of the policy. Web accessibility may need to be on the radar of your marketing department, project managers, contractors, human resources, communications staff, executives, and so on. If they have their own procedural documents, these should include the web accessibility policy, so that it’s always taken into consideration no matter what they’re working on. When it comes to procuring technology from a third party, if you decide to ignore your internal web accessibility policy, then you risk re-introducing barriers that will exclude people with disabilities. Update any procurement policies you follow to ensure they now include references to your web accessibility policy. Make sure that your third-party vendors are aware of the policy, and are offering you products that will meet or exceed the technical requirements for accessibility. Our previous article, ”Here’s How to Boost the Value of a VPAT,” includes a few tips you may find helpful. As an aside, if you have no experience creating and following a web accessibility policy, procurement can sometimes be an easy starting point for incorporating accessibility into your practices and procedures. If your website and other digital properties aren’t currently accessible, add into your policy the milestones you plan to achieve, and the deadlines by which you’ll achieve them. For example, if every web page on your site will meet WCAG 2.0 Level A by June, and will meet Level AA by December, make this a part of the policy. Don’t let your policy fall out of date. 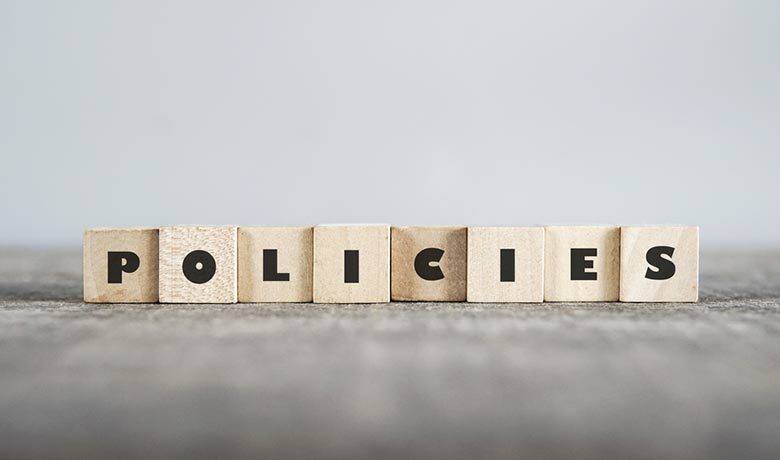 There are several reasons why your policy needs to be reviewed on a regular basis and potentially updated. First, if it does happen to include deadlines, then you’ll want to check that those milestones have actually been met. Second, keep in mind that accessibility standards themselves do get revised or updated from time to time. The newest version, WCAG 2.1, was released just this past June. Third, your organization may, at a later date, add or use new technologies that it didn’t have when the policy was written – or the entire website may be revamped. You need to make sure that the web accessibility policy continues to cover these changes. The WAI notes that it’s actually less costly and time-consuming to be mindful of accessibility from the beginning of a project, instead of turning your focus to it once a project is mostly complete1. If your organization has a clear web accessibility policy in place that follows our do’s and don’ts, this issue is more likely to be top of mind within all of your internal departments.